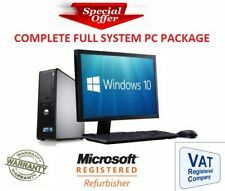 Windows 10 Cheap Fast Dell Core 2Duo Full System 17" Monitor Desktop Computer PC SPECIFICATIONS Condition Refurbished Make/Model Dell Model Varies depending on stock - SFF/Desktop/Tower Processor Intel Core 2 Duo Memory 4 GB Hard Drive 160 GB Screen 17 INCH Drive DVD Rom Operating System Window 10 Home/Pro Varies Power Cable Yes AC Adapter N/A Wireless No USB Ports USB Network LAN Enabled Various 90 Days RTB Warranty Picture is for illustration purposes only. All computers are refurbished PCs. Therefore, there will be some signs of wear and tear. However, there will be nothing major such as large dents and deep scratches. All PCs are checked and tested prior to dispatch. We aim to provide a high class service and should you not be 100% happy, please contact us prior to leaving any feedback. Fast Dell Desktop Pc Tower 6 Ghz 2x3 Ghz E8400 1TB 4GB Ddr2 19" Monitor Wi-Fi(1) Product Description All Prices Include 20 % VAT. VAT Invoice Will be provided. EU VAT Registered business exempt from UK VAT. Please contact us. Windows 10 Home is genuine license. Please note there are additional postage costs for those purchasing outside the UK mainlands or BT Postcode. Please contact us for a quote. SPECIFICATIONS Condition Refurbished Make/Model Dell Processor Intel Core Quad Memory 4 GB (DDR2) Hard Drive 1 TB Screen 19" (Various Brands) Drive DVD RW Operating System Windows 10 Home Power Cable Yes AC Adapter N/A Wireless Yes- USB Wifi adaptor USB Ports N/A Network LAN Enabled Various 365 Days RTB Warranty All computers are refurbished PCs. Therefore, there will be some signs of wear and tear. DELL DESKTOP PC 1TB 4GB, 19″ TFT FLAT SCREEN MONITOR WINDOWS 10 DVDRW CHEAP SALE Product Description 12 MONTHS RETURN TO BASE WARRANTY All Prices Include 20 % VAT. VAT Invoice Will be provided. EU VAT Registered business exempt from UK VAT. Please contact us. Windows 10 Home license is genuine. Please note there are additional postage costs for those purchasing outside the UK mainlands or BT Postcode. Please contact us for a quote. SPECIFICATIONS Condition Refurbished Make/Model Dell Optiplex Processor Intel core 2 Duo Memory 4 GB Hard Drive 1 TB Screen 19" (Various Brands. Depends upon stock Availability) Drive DVD RW Operating System Windows 10 Home Power Cable N/A AC Adapter N/A Wireless Yes- USB Wifi adaptor USB Ports 7 USB Network LAN Enabled Various 365 Days RTB Warranty All computers are refurbished PCs. 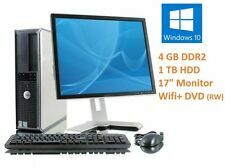 DELL DESKTOP PC SET QUAD CORE CPU 500GB 4GB DDR3 WI-FI WINDOWS 10 MONITOR 19"
DELL Desktop PC SET. genuine Windows 10 installed. 19" MONITOR. 500 GB Hard Drive. 19" Grade A Lcd Monitor. Ready To Use Just Plug In And Enjoy. Gaming PC take a little bit longer usually is dispatched after 48h. DELL DESKTOP 380 PC C2D E8400 3GHZ CPU 250GB 4GB DDR3 WI-FI WIN 10 MONITOR 17"
DELL Desktop 380 PC SE T. 17" MONITOR. 17" Grade A Lcd Monitor. Gaming PC take a little bit longer usually is dispatched after 48h. Open Office For All Office And School Work. 760 Small Form Desktop and 17" flat screen monitor. Dell Optiplex Full System. Windows 10 Pro installed. Three month warranty. SPECIFICATIONS Condition Refurbished Make/Model Dell Processor Intel core 2 quad Memory 4 GB (DDR2) Hard Drive 240 GB (SSD) Screen 17" (Various Brands) Drive DVD RW Operating System Windows 10 Home Power Cable Yes AC Adapter N/A Wireless Yes- USB Wifi adaptor USB Ports N/A Network LAN Enabled Various 365 Days RTB Warranty Pictures are for illustration purposes only. Model may vary depending on stock. These are refurbished PCs and will have signs of usage but nothing major such as large dents etc. You will be sent a system that matches the specification of the listing. TFT will vary in make and model depending on stock unless specifically stated. All PCs are checked and tested prior to dispatch. 780 Small Form Desktop and 20" flat screen monitor. Dell Optiplex Full System. Windows 10 Pro installed. 1 x Display Port, 1 X VGA, 1 x Ethernet, 8 x USB ports. Microsoft Office 2016 full version. Adobe Acrobat DC. Desktop PC with Windows 10 Professional. Dell E2211HB Black 22" WideScreen Screen 1920 x 1080 Resolution LCD Flat Panel Monitor. Windows 10 Professional. VERY LIGHTLY USED in a perfect condition. FAST DELL OPTIPLEX DESKTOP TOWER. 4 GB RAM DDR3. 17" MONITOR GRADE A. 22" TFT £40. 17" TFT £20. 19" TFT £25. IF YOU NEED ANY OTHER COMPONENT TO UPGRADE THIS PC WE ARE HAPPY TO HELP YOU WITH THAT. Gaming PC take a little bit longer usually is dispatched after 48h. SPECIFICATIONS Condition Refurbished Make/Model Dell Processor Intel Core Quad Memory 4 GB (DDR2) Hard Drive 1 TB Screen 19" (Various Brands) Drive DVD RW Operating System Windows 7 Professional Power Cable Yes AC Adapter N/A Wireless Yes- USB Wifi adaptor USB Ports N/A Network LAN Enabled Various 365 Days RTB Warranty Pictures are for illustration purposes only. Model may vary depending on stock. These are refurbished PCs and will have signs of usage but nothing major such as large dents etc. You will be sent a system that matches the specification of the listing. SPECIFICATIONS Condition Refurbished Make/Model Dell Processor Core 2 Duo Memory 4 GB Hard Drive 1 TB Screen 19" (Various Brands) Drive DVD ROM Operating System Windows 7 Professional Power Cable Yes AC Adapter N/A Wireless Yes USB Ports 7 USB Network LAN Enabled Various 365 Days RTB Warranty Pictures are for illustration purposes only. Model may vary depending on stock. These are refurbished PCs and will have signs of usage but nothing major such as large dents etc. You will be sent a system that matches the specification of the listing. TFT will vary in make and model depending on stock unless specifically stated. All PCs are checked and tested prior to dispatch. Form Factor – Small Form Factor (SFF). Hard Drive – 1TB. Mouse and keyboard. Buying with The Apple Centre. AOC E2250SWDAK 21.5″ LED Monitor with Full HD. 21.5″ AOC E2250SWDAK Monitor. Product Reference: SKU4372. Gaming Desktop Pc, Includes Gaming Monitor, Keyboard, mouse. BenQ GL2250 21.5” Gaming Monitor. HP Keyboard. (DVI, VGA, HDMI). I5-4460 cpu @ 3.20ghz. Processor Cooling Corsair H80i Hydro Series High Performance CPU Cooler. External Hard Drive NONE. Waterproof keyboard. USB/Thunderbolt Options MIN. 2 x USB 3.0 & 4 x USB 2.0 PORTS @ BACK PANEL MIN. Fast Dell Optiplex Desktop Tower Pc. 19" Grade A Monitor. 22" TFT £40. 19" TFT £25. 17" TFT £20. Gaming PC take a little bit longer usually is dispatched after 48h. NEW KEYBOARD AND MOUSE £15. WE CAN INSTALL MICROSOFT OFFICE 2010 AND WINDOWS 10 FOR FREE. FAST DELL OPTIPLEX DESKTOP TOWER. 17" MONITOR GRADE A. 22" TFT £40. 17" TFT £20. 19" TFT £25. Gaming PC take a little bit longer usually is dispatched after 48h. NEW KEYBOARD AND MOUSE £15. WE CAN INSTALL MICROSOFT OFFICE 2010 AND WINDOWS 10 FOR FREE. Core 2 Duo 3Ghz processor. HP Desktop and 17" flat screen monitor. Windows 7 Pro installed. Picture for display purposes only. Three month warranty. Fast Dell Optiplex Desktop Tower Pc. 17" Grade A Monitor. 500 Gb Hard drive. 22" TFT £40. 17" TFT £20. 19" TFT £25. Gaming PC take a little bit longer usually is dispatched after 48h. NEW KEYBOARD AND MOUSE £15. SPECIFICATIONS Condition Refurbished Make/Model Dell Optiplex Processor Intel Quad Core Memory 8 GB Hard Drive 1 TB Screen 19" (Various Brands. Depends upon stock availability) Drive DVD ROM Operating System Windows 7 Professional Power Cable N/A AC Adapter N/A Wireless Yes- USB Wifi adaptor USB Ports 7 USB Network LAN Enabled Various 365 Days RTB Warranty Pictures are for illustration purposes only. Model may vary depending on stock. These are refurbished PCs and will have signs of usage but nothing major such as large dents etc. You will be sent a system that matches the specification of the listing. TFT will vary in make and model depending on stock unless specifically stated. 755 Small Form Desktop and 17" flat screen monitor. Dell Optiplex Full System. Windows 10 Pro installed. Three month warranty. SPECIFICATIONS Condition Refurbished Make/Model Dell Processor Intel core 2 quad Memory 4 GB (DDR2) Hard Drive 240 GB (SSD) Screen 17" (Various Brands) Drive DVD RW Operating System Windows 7 Professional Power Cable Yes AC Adapter N/A Wireless Yes- USB Wifi adaptor USB Ports N/A Network LAN Enabled Various 365 Days RTB Warranty Pictures are for illustration purposes only. Model may vary depending on stock. These are refurbished PCs and will have signs of usage but nothing major such as large dents etc. You will be sent a system that matches the specification of the listing. TFT will vary in make and model depending on stock unless specifically stated.